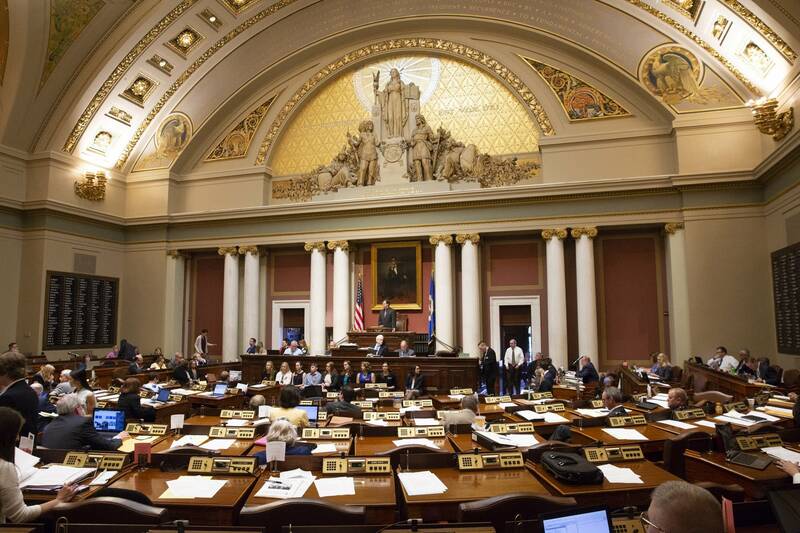 Minnesota's 2019 legislative session is officially at its midway point. As Gov. Tim Walz travels around the state, making the case for his budget, lawmakers in St. Paul are churning through bills in order to meet the May 20 deadline to adjourn. On Monday, legislators will consider a registration fee for drug manufacturers and distributors to do business in Minnesota to raise funds for opioid addiction treatment and prevention. A similar bill passed through the Senate last year but fell apart on the House floor, with some criticizing House Republicans, who were in control at the time, claiming they were swayed by Big Pharma. Things could be different this year now that Democrats control the House. There are also signs that Democrats and Republicans are working together on a deal. The same appears to be true for a hands-free cellphone bill which stalled in the Senate last year. The bill would require drivers who use cellphones to use only hands-free devices. The bill seems to be moving quickly and if passed Minnesota would join 17 states and D.C. in having a law like this in the books. With some exceptions, bills needed to clear at least one policy committee by last Friday in order to be considered viable moving forward. There are ways those in the majority can bring topics back up through the Rules Committee or by including amendments in larger, omnibus bills, but there's at least one issue that appears to be dead in the water: legalizing recreational marijuana. A related bill did get a hearing in the Senate but was voted down, along with a task force to study marijuana legalization. The House has not scheduled a hearing for a companion version of the bill. Up for a hearing this week in the House Legacy Committee: Minneapolis Rep. Ray Dehn wants to use money from a constitutionally-dedicated fund for community arts and cultural heritage projects to pay for a $250,000 mural of musician Prince to be painted somewhere in downtown Minneapolis.